Of particular interest will be the details Gray reveals for the first time about Rosa Parks’s 1955 arrest. 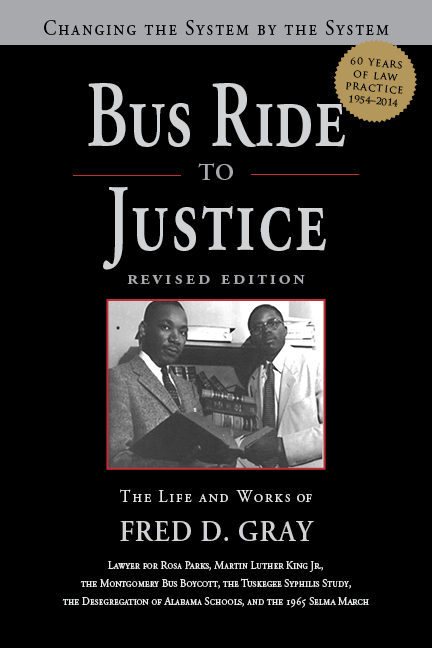 Gray was the young lawyer for Parks and also Martin Luther King Jr. and the Montgomery Improvement Association, which organized the 382-day Montgomery Bus Boycott after Parks’s arrest. As the last survivor of that inner circle, Gray speaks about the strategic reasons Parks was presented as a demure, random victim of Jim Crow policies when in reality she was a committed, strong-willed activist who was willing to be arrested so there could be a test case to challenge segregation laws. Gray’s remarkable career also includes landmark civil rights cases in voting rights, education, housing, employment, law enforcement, jury selection, and more. He is widely considered one of the most successful civil rights attorneys of the twentieth century and his cases are studied in law schools around the world. In addition he was an ordained Church of Christ minister and was one of the first blacks elected to the Alabama legislature in the modern era. Initially denied entrance to Alabama’s segregated law school, he eventually became the first black president of the Alabama bar association. This volume also includes new photographs not found in the previous edition.